Dortmund general manager Michael Zorc claims Marco Reus’s decision to extend his contract with his hometown club until 2019 has ‘unshackled’ the wizard of the dribble. It definitely seemed the case on Friday night, with the spiky-haired forward netting one goal and making another in the 4-2 home victory over Mainz, a result which hauled Jurgen Klopp’s side out of the relegation quicksand. Reus was happy to put speculation about a move to England or Spain on the back-burner and his new deal – which crucially does not include a release claus and will net him ten million euros a year – has re-energised the whole Yellow-and-Black nation and in this most difficult of seasons. The sea-change in mood is welcome indeed. Two years after being thumped 9-2 on Bayern Munich turf, the northerners latest trek to the Bavarian capital proved just as humiliating, this time conceding eight goals without reply as the hosts recorded their fourth-biggest victory in 50 years of Bundesliga action. Yes, Bayern were in fine fettle, moving forward with much more tempo than in recent weeks. But how their task was facilitated by the eleven HSV apparitions in the opposition ranks. Trailing 3-0 at half-time, Hamburg simply gave up the ghost in the second period and such a lack of mettle and guts must have rookie coach Joe Zinnbauer quaking in his boots. 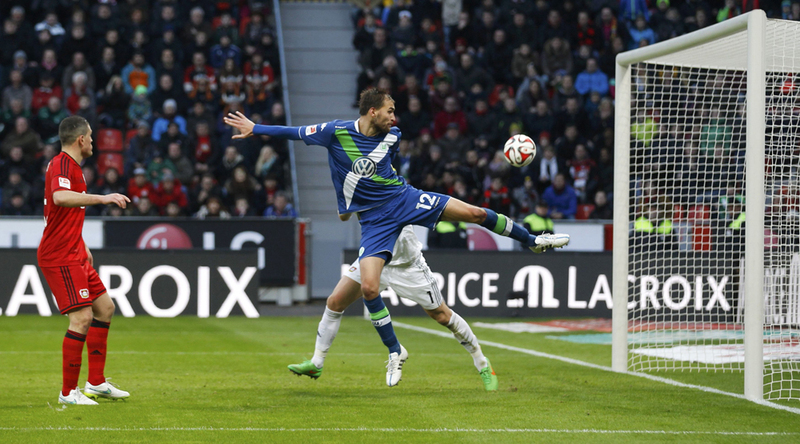 With 38 goals scored in nine fixtures – generating no fewer than 4.22 goals per game – the top-flight enjoyed its most prolific weekend of finishing since the second round of the 2010-11 campaign and nowhere was the art of the marksman more in evidence, than Leverkusen’s Bay Arena, where in-form Wolfsburg eventually prevailed 5-4 in an action-packed, see-saw encounter. Wolfsburg’s first victory there in 18 attempts principally was the work of Dutch striker Bas Dost (pictured above), who not only scored four, including a late winner, but did so using the full repertoire: head, right-foot and left. The 82nd Bundesliga head-to-head of Monchengladbach Foals and Cologne Billy Goats was a heroes and villains affair, Gladbach’s Swiss midfielder Granit Xhaka heading home the only goal of the game in injury-time to scoop the glory, while a number of visiting Kolner ‘fans’ disgraced themselves. Besides letting off a barrage of flares, thus forcing the referee to interrupt the game in the second-half, some thirty individuals, all masked and wearing white overalls, stormed the pitch at the final whistle to fight with stewards, police and home supporters and following this bout of Clockwork Orange violence, the DFB surely will get tough. To give them their due, the rock bottom Schwaben did at least manage to score their first in goal in 448 minutes in the south-west derby at Hoffenheim on Saturday – Japanese full-back Gotuku Satai supplying the limited edition goods to equalise at 1-1. But as has happened so often this term, the Stuttgarter ended up pointless, a mistake from young centre-back Timo Baumgartl leading to Hoffenheim midfielder Sebastian Rudy firing in a 93rd minute winner. Since his appointment in December, Stuttgart boss Huub Stevens only has picked up nine points out of a possible 27 and unusually for him, looks perplexed and not in control. Rumours abound that Felix Magath will be called in as fireman.